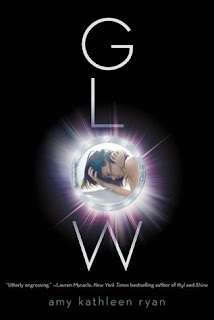 Pulse-pouding and addictive, GLOW begins the most riveting series since The Hunger Games. In this thrilling first installment, a violent battle separates two young lovers on a ship bound for New Earth. Will they find a way back to their ship - and each other? And most importantly, will they survive and preserve the future of the human race? Oh, how I wanted to love this book! I practically pounced on the display at BEA and was highly anticipating reading it. In the end, though, it just didn't quite work for me. None of the main three characters - Waverly, Kieran, and Seth - were particularly relatable. And while the story had an interesting premise, the religious aspect really ruined it for me. All of this combined with the too-choppy switching viewpoints made it a very tough read. I was invested in the story (even if I didn't like the characters and the format was difficult to slog through) up until the last few chapters, at which point I very nearly gave up. Again, it was the religious angle. I didn't like reading about it from either of the narrators' perspectives. If you're looking for a good YA "spaceship traveling to a new planet" story, feel free to give this one a shot - the parts that didn't work for me may well work for you. However, I would recommend Across the Universe by Beth Revis instead.